From a distance – apart from the trendy Star Trek like glasses – Brian and Beverly Casey look like any other couple in love. They are sat holding hands, Brian is gazing into the eyes of his wife and telling her how ‘gorgeous’ she looks. Even the Press – gathered to witness a miracle of technology – aren’t intruding on the moment. “You are gorgeous,” he says. “But then I always knew that. It’s come about as a result of an innovation in e-glasses, the latest eSight Eyewear created in Canada. Each set is manufactured to order. Associated Optical are the sole distributors for the UK. The glasses don’t come cheap – the £10k cost reflects the high cost of development, research, expertise and components. He admits the hardest moment comes each time he has to hand the glasses back. He can’t afford £10k. 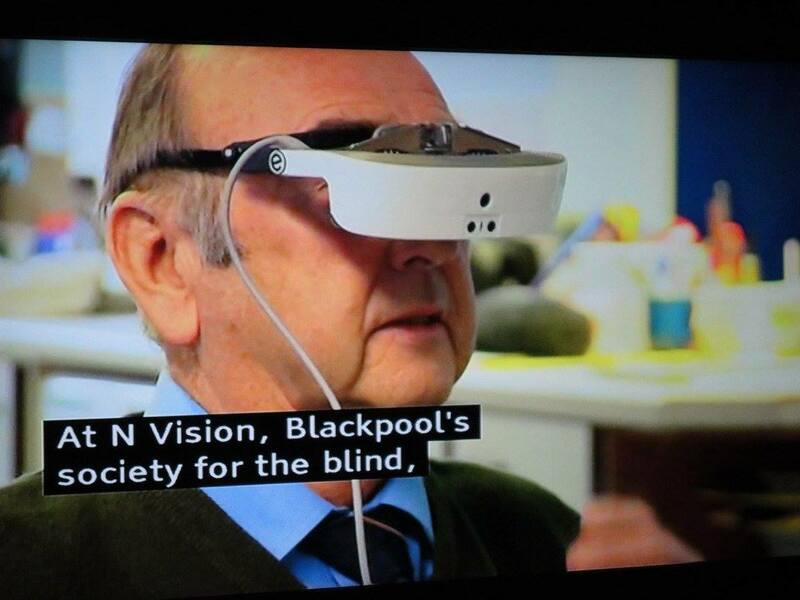 Nor can N-Vision, the Blackpool Fylde and Wyre Society for the Blind. He’s their Low Vision worker. The charity has around 3000 clients and service users on its books as well as in residential care. With a raft of services available they have to make every penny count. Brian’s hoping for another miracle – to source some funding. Normally he sees everything as a ‘blur’, no detail, no real idea of colours, or facial expressions, or what people look alike – let alone body language. He can hear smiles rather than see them. It’s been (almost) all smiles since the news broke at N-Vision’s Blackpool base. 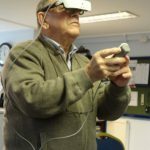 Ten immensely courageous individuals, all of them severely sight impaired, registered ‘blind’, have come to try the eSight Eyewear for themselves. Seeing really is believing. Having the media present – the test is one of the lead items on that night’s regional BBC NWT programme as well as That’s Lancashire TV and BBC Radio Lancashire, Radio Wave and the local papers – tends to chivvy along the process slightly. The Press want to see results faster than the usual one and half hour assessment would permit for each client. So the really good news is N-Vision is hosting another session soon with Associated Optical back on site. This time at their area manager Nick Hamlett’s preferred pace, prescriptions assessed, time spent showing how to tweak the controls and adjust the field of vision. It’s emerging technology and the internet is only just beginning to buzz with the news as more report spectacular results. Associated Optical report that the glasses have worked for 70 per cent of people who have tried them on and “allowed people with traumatic eye injury, some forms of Glaucoma, Macular Degeneration, Diabetic retinopathy and more than a dozen other conditions to see instantly”. 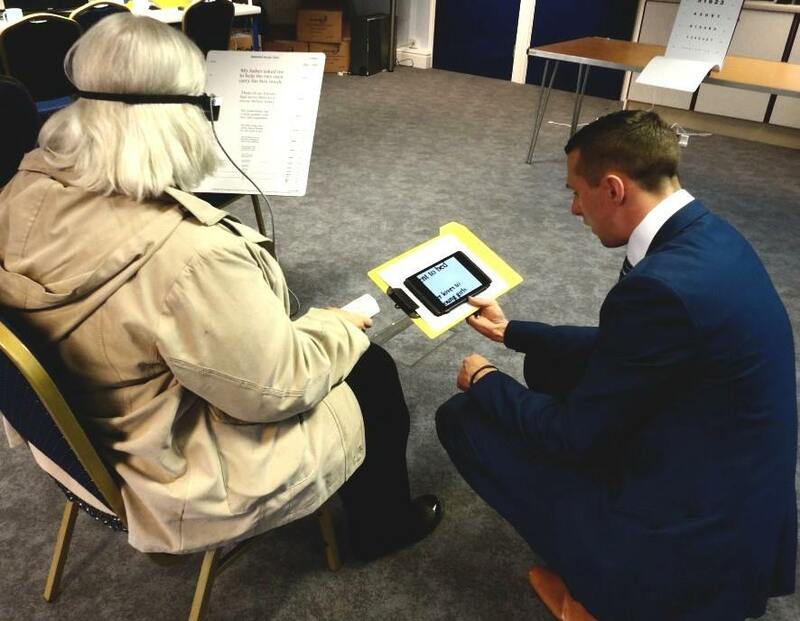 Even with a bit of a rush on it’s pretty much the same result for the test group at Blackpool – most have macular degeneration but some have lost sight to stroke or other conditions. It’s an incredibly moving day, full of light, laughter, joy, tears – and some disappointment. Most will book back for a second session, away from the media melee – because this is one heck of a story, breaking news of the best sort. 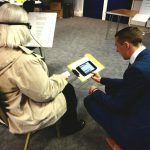 Of course, the biggest stumbling block is the money – how wonderful it would be, for example, if the charity had its own headset to demonstrate to service users, or even to facilitate them seeing loved ones again, grandchildren they may have never seen. It’s food for thought – and potential funders. William is there, 72, a chap who built a very successful business in south Fylde. He featured on BBC NWT thanks to a bit of banter with the presenter Stuart Flinders over who could ‘read’ the time accurately. 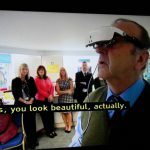 William, in his new eSight glasses, won that battle – just minutes after he had been struggling to read large print in his usual prescription specs. He may, however, have lost the war having told his partner Dot that she has ‘one or two more wrinkles’ than when he last saw her. So have you, she retorted..
Like William and Jeff, Brian – the man who brought the good news to Blackpool – is keen to see a football match. He’s set his sights on Fleetwood FC as his favourite club Watford is too far away. As William puts it: “It would be great to stand up with all the rest when a goal is scored – instead of being the one sat down wondering what’s happened.” Wouldn’t that be a great day out for all three? 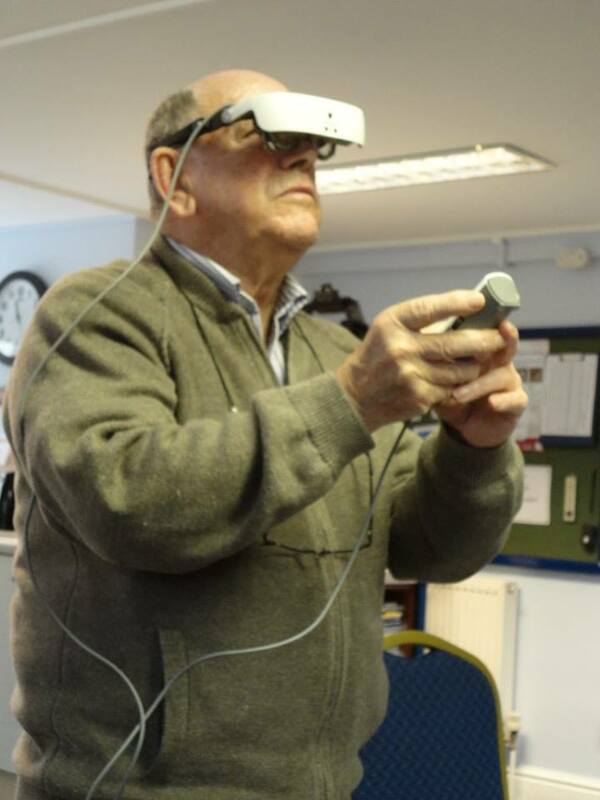 Low Vision worker Brian is as sports mad as he was when he used to tear around race tracks in a Lotus, and play squash for Hemel Hempstead, and snooker and darts with his dad. It was a five a side footie match 27 years ago which cost the sight in his right eye, when the ball broke his cheekbone and damaged his sight. 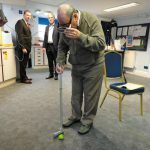 It was then he realised he’d lost the sight in his left eye already – to an earlier accident, this time with an opponent’s squash racquet in a highly competitive match. Brian had played on after being struck on the temple accidentally, did the usual ‘how many fingers am I holding up’ test at the hospital, passed and went on his way. His eyes were bandaged for months, but it didn’t save his sight. He went to an RNIB rehab centre in Torquay where he met a young woman, sightless from birth, who told him he could be anything he wanted to be. He took part in all the competitive events at the centre, smashed the records, and married Bev 10 years later. They have been married 17 years, together for 27 years. It was the ultimate ‘blind date’, Brian adds. 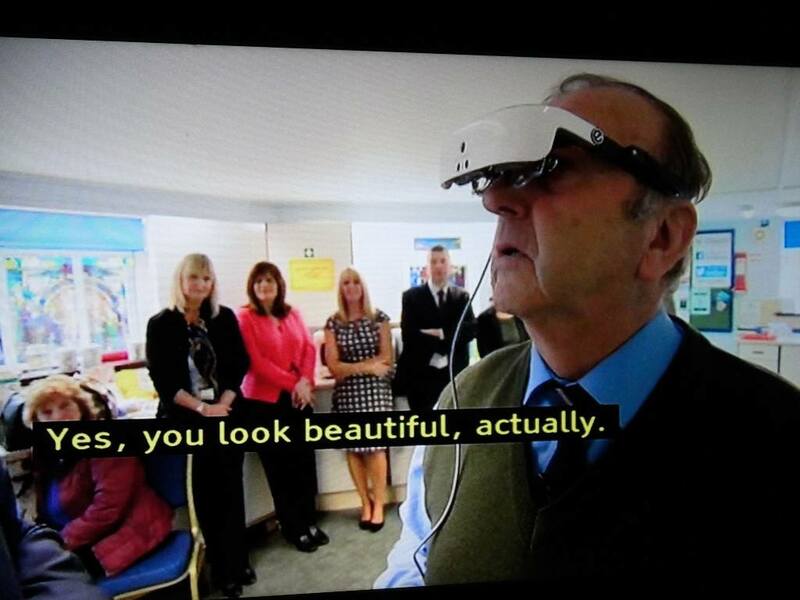 The e-Sight glasses don’t work for everyone – and sadly they didn’t work for Bev. Not that she minds. 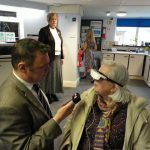 She’s immensely proud of her husband and is thrilled that the headset enables him to see again… for as long as he has it on. And there’s the rub. “What price getting your sight back?” he asks. Brian first tried the glasses at the 100% Optical exhibition in London last month when Associated Optical, well known to N-Vision as suppliers of visual aids, invited him to the European launch of eSight Eyewear. He became the very first person in Europe to try the glasses, which wouldn’t look out of place on the trendy ski slopes of St Moritz or the set of the latest Star Trek movie. “It was like a miracle,” says Brian. What he saw was relayed via a giant screen to others in the conference hall. He saw his wife for the first time – and his father for the first time since losing his sight 27 years ago. “Bev looked gorgeous – and dad had a few more wrinkles,” says Brian. He also homed in on the bosom of a dancing girl at a neighbouring stand – insisting that was because “I could see a mole there – and I was just marvelling at the detail of all I could see, facial expressions, the colour of someone’s eyes, their hair, even the nuts and bolts in the ceiling. 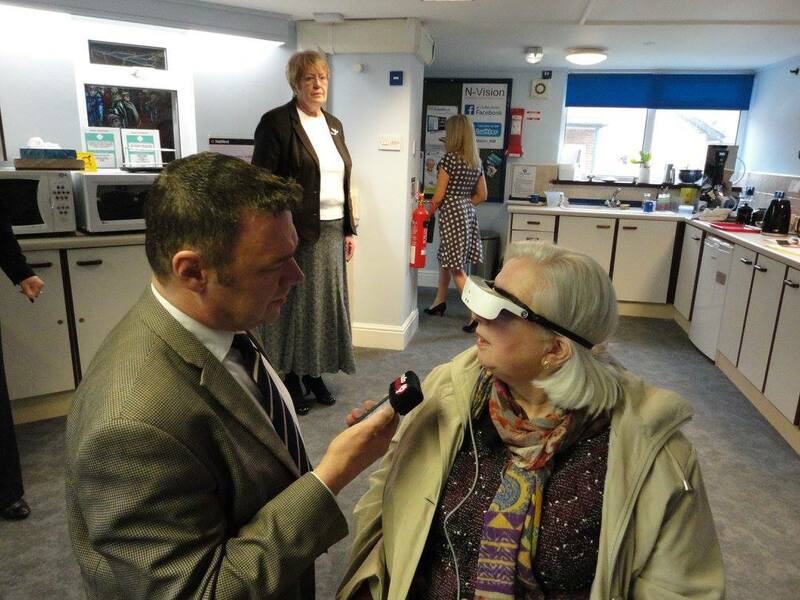 But the moment N-Vision had been waiting for came when regular visitors to the resort based charity Associated Optical brought the headset – the only one of its kind in the country – to Blackpool so that others could try the ‘miracle glasses’ and hopefully see for themselves. On a gloriously sunny day those, for whom the glasses worked, and others watching on, were reminded of just what a Wonderful World it is, with signs of Spring all around. 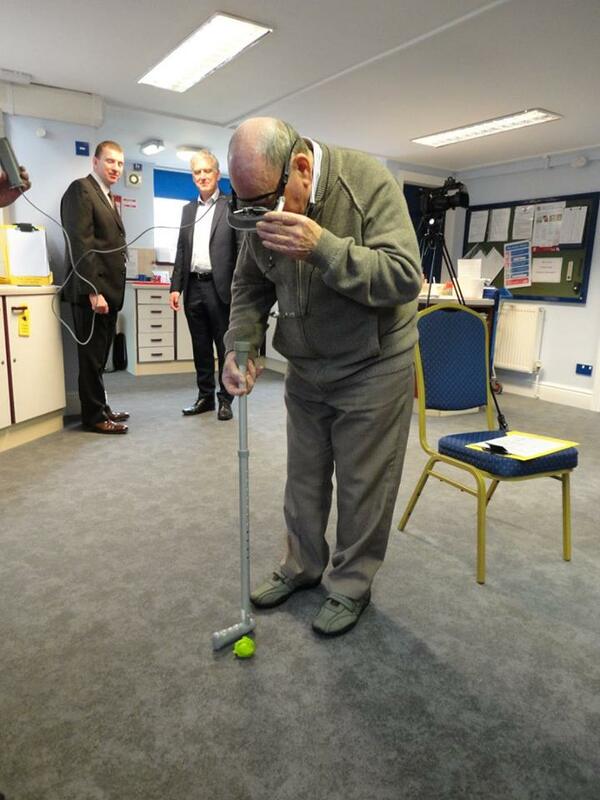 The Low Vision Centre is based at Bosworth Place, off Squires Gate Lane, Blackpool. it exists to help, support and give information to those coming to terms with sight loss. It’ s a place where emotional and practical support is given, access to benefits advice, information sessions, audio services, support groups for those with macular degeneration and those whose sight has been affected by a stroke or other conditions – along with access to specialist equipment including magnifiers and electronic reading aids. 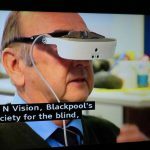 And it’s just one of the crucial services offered by N-Vision, the trading name of Blackpool Fylde and Wyre Society for the Blind, which was established more than 100 years ago and helps around 3000 people with reduced vision regardless of means. It also runs residential care. This year marks the 40th anniversary of the society’s Talking Newspaper service – another lifeline for those who can easily feel cut off from what’s happening in the community around them.